November 5, 2018--Have stitched as much as possible on this cutie. Now need to find a white, loopy yarn for the beard. Janet Zickler Casey's instructions call for RG Fluffy Fleece in white, but that is no longer manufactured. What's available is Fluffy Fleece in an ecru color which I think is too dark. When I asked Janet for a substitute, she suggested going to a yarn shop and finding a "chenille" style yarn. Perfect. Now to go shopping. 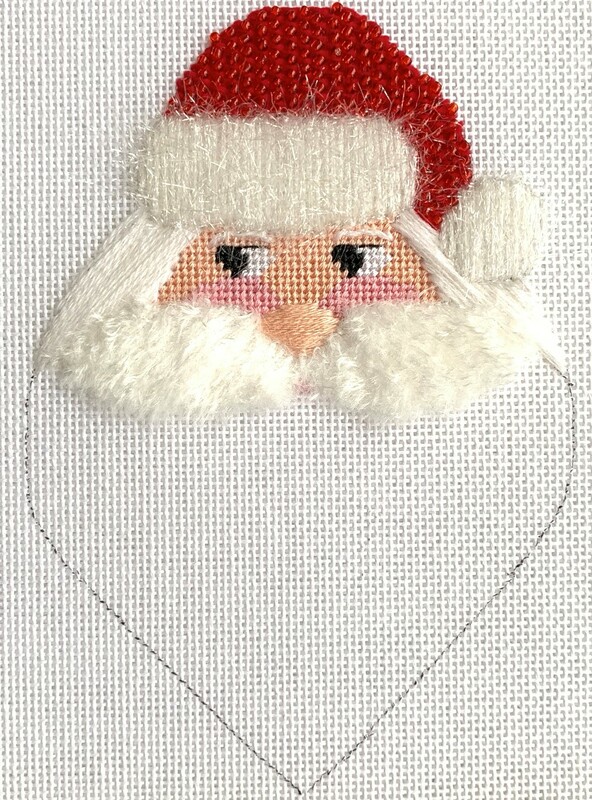 January 17, 2016--Have begun stitching this adorable santa ornament designed by Janet Zickler Casey. Found this cutie on eBay. Hope to find more of these santas either on eBay, SNS, or on Facebook needlepoint seller sites. See the In Process Projects page on the right for a look at the project photo. What thread is that lovely moustache? Hi Melita. The moustache was stitched with Fabulous Fibers Peluche. What stitch did you use. I have Fyzzy Stuff and I think that will work well if I have the rightcstutchvto do. Thank you. The instructor calls for couching RG Fuzzy Stuff. Unfortunately this thread is no longer available in white, ecru color only. I recently purchased some thick white yarn at a yarn shop and I'm going to try couching it down.